EYES ON THE BALL: Central FC's Keron Cummings, left, looks to make a play in the First Citizens Cup final on Friday. 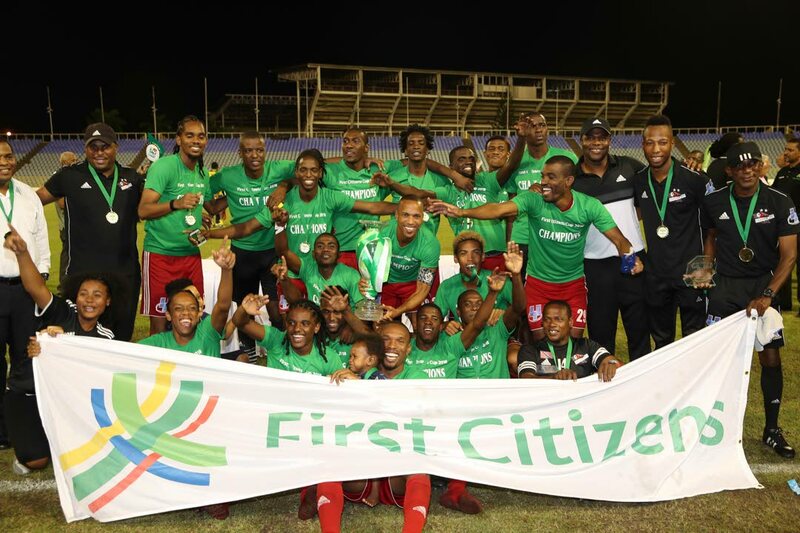 KERON Cummings put on a show on Friday to help Central FC win their third First Citizens Cup via kicks in a pulsating final against Defence Force at the Hasely Crawford Stadium, Mucurapo. Cummings fired in a double in a 2-2 draw after 120 minutes of football and made no mistake from the spot in the penalty shootout as Central prevailed 4-2. 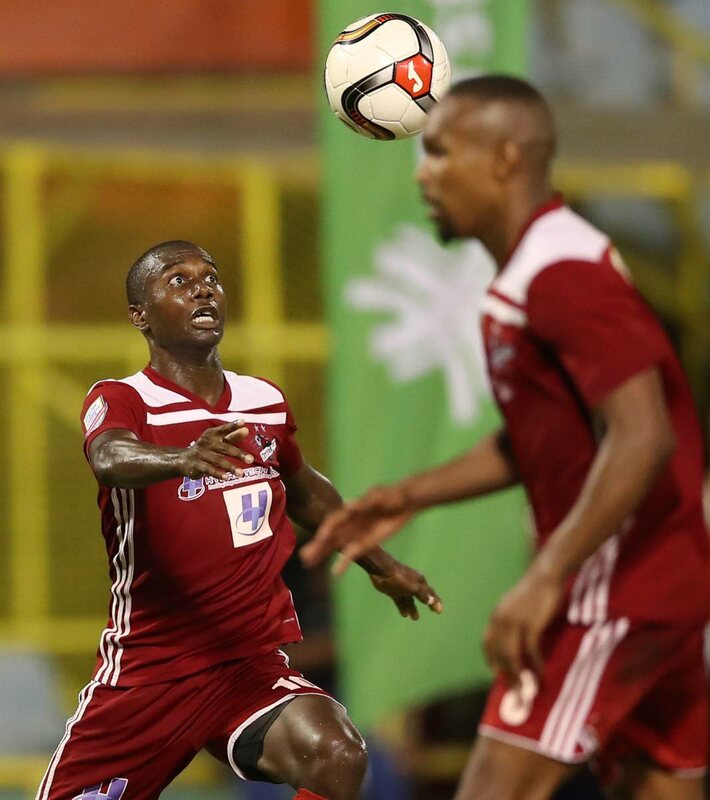 Cummings, back at Central FC after a season in the TT Super League with Petit Valley/Diego Martin United, scored in the 42nd to put his team ahead and netted again in the 83rd minute to force the game into extra time at 2-2. Defence Force got goals from Dylon King (64th) and Devorn Jorsling (65th). The 30 year old, who missed a portion of the 2015-2016 local season after a gunshot wound to his right foot in December 2015, said, “It’s always a good feeling to score goals. But I feel (this) game was more a leadership game for me. I based the game as a leader, trying to drill the boys to come up to the standard so we could get the win. “The goals (were) not really a big difference because that’s what people expect of me,” he added. Cummings has a record of three goals from 15 internationals but had a breakout performance at the 2015 Gold Cup and was poised for a move to North America when tragedy struck. After the 2015 incident, he made two appearances under the current tenure of coach Dennis Lawrence – a 2-0 win at home to Barbados in March 2017 and a 2-2 draw away to Grenada a month later. And he is not giving up on making a return to the national squad. In the penalty shootout, Central FC, who only fielded four substitutes (but no reserve goalkeeper), led 3-1 after Kerry Baptiste, Akim Armstrong and Cummings converted their efforts. Hashim Arcia scored Defence Force’s first kick, but King missed the target and Reon Moore struck the crossbar. Needing to score to seal the game, Taryk Sampson’s effort was saved by Defence Force’s goalie Sheldon Clarke, and Brent Sam kept the Army-Coast Guard combination in the match when he reduced the deficit to 3-2. Duane Muckette, who wore the captain’s armband for the match in place of the injured Densill Theobald, smashed home his shot via Clarke’s right fingertips to spark off wild celebrations by his teammates. Central FC were previous winners in 2013 and 2014. Defence Force midfielder King, who scored in regulation but missed in the shootout, had to be consoled by his team’s assistant coach Devin Elcock. Defence Force suffered an early setback when defensive midfielder Dave Long had to be replaced by Moore in the 17th minute due to injury. Three minutes later, with the goal at his mercy, Moore struck his right-footed effort straight at Central FC’s goalie Marvin Phillip. Just before the half, national defender Curtis Gonzales was caught in possession by Armstrong who teed up Cummings to his right. Cummings faked central defender Rodell Elcock before placing his shot past the right of a wrong-footed Clarke. Defence Force came out firing in the second period and the momentum swung in Defence Force’s favour with two goals in successive minutes. In the 64th, Jorsling got a ball from Sam on the right, and fed a goal-bound King whose right-footed blast was parried into his own net by Phillip. A minute later, Moore, marauding down the left flank, squared a pass into the path of Jorsling but Phillip failed to hold on to the ball and it was left to Jorsling to guide the ball into the open goal. Phillip redeemed himself with a good save to deny Arcia in the 80th, after spilling a long-distance shot from King. That save proved crucial as three minutes later, Central FC got the equaliser. A blunder by Clarke almost caused a goal but the ball was cleared off the line by an alert Gonzales for a throw-in. From the resulting throw, however, the ball fell to Cummings on the right and the midfielder unleashed a wonderful left-footed shot from 30 metres out which flew past a stunned Clarke and shook the net. At opposite ends, King (87th) and Cummings (90th) saw chances denied by alert goalkeeping. And in extra time, Baptiste had a shot rebound off the upright and Moore forced a good save from Phillip. Reply to "Cummings stars as Central FC win First Citizens Cup final"